London in the 1960's was lively and at the forefront of style and music. It was a happening place. But one could also find places that were more tranquil. Places to reflect upon life. Sights that brought wonder into one's heart and mind. Places where people communed with each other and the fauna around them. It was a more innocent time, although not innocent at all. Then was the time of SLR photography. Black and white photographs were seen to be artistic. That was the time when I opened my camera lens and shot what I thought inspiring. It has taken over 40 years for me to present my 'eyes view' of the world in poster form. Here you will find some of those images, which are now available for sale. I hope you enjoy. 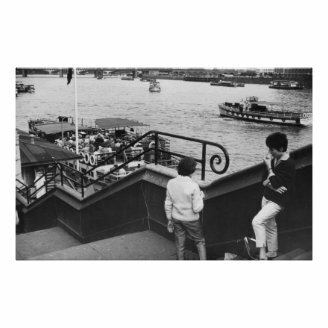 Here are a few images of London shot in the 1960's. I have created a Zazzle store so they may be able to be appreciated (hopefully) and purchased (hopefully). These six images are but a small glimpse of those available. They show a cross-section of the types of images available. All are black and white images taken with a standard SLR camera without telephoto lens. The links are to the largest size of poster. However, each can be obtained in numerous other sizes, with prices to below $7. They can be printed on a number of different papers. And they may be framed if you so wish. Each of the posters is available for customization - so you can add your own words to the image. Some of the images are available in postcard form, but only those that conform to a standard postcard format. 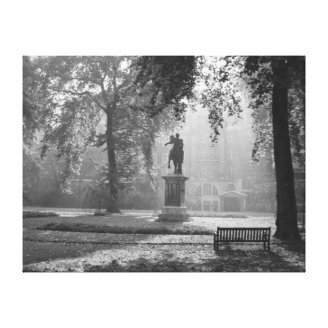 A black and white photo image on canvas of 'Morning In The Square'. This image was shot on a misty morning in September 1968. I couldn't remember the name of the square - until JoHarrington suggested Whitehall Square or somewhere nearby. I then recognised the statue as the one in St James' Square. Thanks Jo for jogging my memory - oh the ravages of time on brain matter. The image reminds me that it was very early, as there were no other people about. Today that is not very common - people are either going home after a late night, or taking advantage of the lack of traffic to get to work early these days. The 1960's were a simpler time. There was still the hustle and bustle, but it seemed to be less stressful than now. I hope I captured the essence of the day in this image. 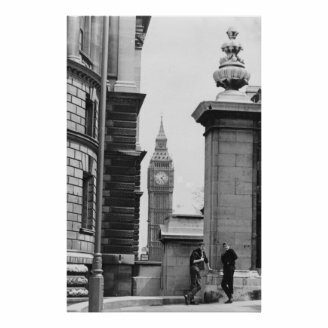 A black & white photographic view of Big Ben (London) from a back street in the 1960's. Actually, this is a picture of the Clock Tower, now named the Elizabeth Tower. Big Ben is in fact the bell of the clock, which obviously cannot be seen in this image. However, the tower, clock face and the bell are all generally known as 'Big Ben'. The tower is attached to the British Parliament building. 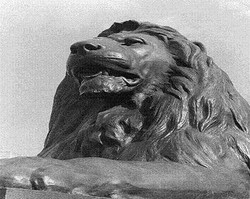 This image was taken from the north side of Parliament Square, so you are viewing the north face of the clock. The largest size of this poster is approximately 40" X 60". 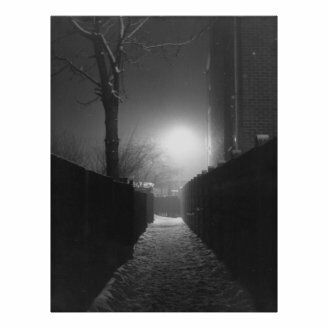 A moody black and white image of a snow strewn pathway in London, lit by a single bright light. Back in the sixties snow rarely fell before Christmas, as I recall. So, this photo must have been taken well into the New Year. Snow was not removed from back streets then or now, so the paths became icy due to being trodden down by footfall. This night-time shot brings memories back of iced-up windows in my bedroom. We did not have the luxury of central heating back then. The young of today do not know how well off they are. The bright light glimmers back at us off the icy snow, lighting the way even more. The largest size of this image is approximately 40" X 52". 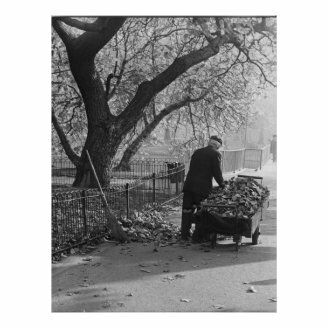 A black and white photograph of a gentleman worker raking up leaves in a London park and removing them on a wheeled barrow. This image was taken on a misty morning in late autumn in the late 1960's. You are unlikely to see this scene again as all park attendants now have to wear high-viz yellow over-garments for the sake of safety. It would have been tragic if the wind had blown just as the barrow was full. The largest size of this image is approximately 40" X 53". This image harks back to the time when one could see the constabulary on horseback around the parks and streets of London. 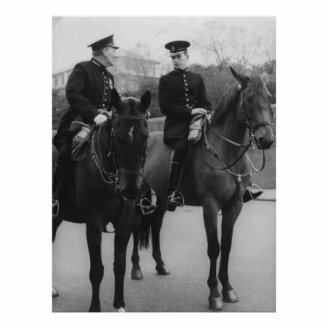 This black and white photo image from the 1960's evokes memories of days when you actually saw police on the streets, mounted or otherwise. Today they are seldom seen in person. The horse division of the police is very much depleted now. The cost of keeping the horses has meant their almost complete demise. Here we have a black and white photo image of the age of innocence. 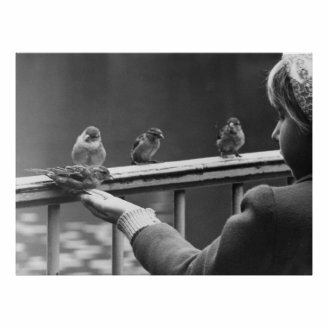 The 1960's saw house and tree sparrows prevalent throughout urban Britain. Now they are seen more rarely. This scene shows that there can be trust between wild animals and the human population - especially where the young are involved. Even British birds are wont to form an orderly queue, waiting for their turn at the hand that feeds them. The largest size of this image is approximately 53" X 40". A black and white photo image of a time (1960') when the Thames was awash with river cruise pleasure boats plying their trade from wharfs close to the City of London. They are still available, but not in the numbers that they once were. If you want to see London, then these and City bus tours give a great opportunity to see it from a different vantage point. Back then a river boat tour up the Thames and back was a must for any visitor to London. The largest size of this image is approximately 51" X 33". Each of the above images, and many more, can be purchased from my Zazzle store. If you like any of the images please visit them in store and leave a comment. Great impact posters. well chosen. We certainly did not see ourselves as anything other than the sophisicats - seeing in a new world order based on love and freedom. Where did those concepts go? Great photos, and love your descriptions. Yes, brings back the simpler times of the 60s - funny, never thought we'd say that back in the 60s! Lovely photos! I've been very interested in checking out Zazzle. I enjoyed your article! SheilaM - as you may have guessed I agree entirely with your viewpoint that black and white imagery is very expressive. Thanks for the 'nice posters' comment. And thank you all those people that 'gave a 'thumbs up' like to this article. Nice posters! There's something very expressive about black and white.